So, 4 days in and we’re already 50% of our goal! Yay! In case you hadn’t seen…we have several “PUSH GOALS” to meet that would unlock special new things. T-Shirts, Sketchbooks, more cards, and…Nicodemus Plushes! So, please help us push past our goal so we can all get Nicodemus plushes…okay? This is the last page of the flashback. The answer, of course, is that ONE portal doesn’t do anything. You need the Earth one (which Ramses destroyed). Do you feel the extra two pages are needed? or do you feel it would be redundant? I think a simple comment, similar to what you just stated, would suffice for explaining how the portals work. They are pretty adventurous to take on the Nightmare realm all on their own! I agree with you regarding a simple comment being all that’s need to remind some readers of the fact, perhaps as a casual mention by another character to Alex as a curt reminder in itself? Maybe if you could fit it into one comic, otherwise i agree with IamMac. p.s. I love your work here and would donate more to the kickstarter if I had any money. My only gripe about this page is about Titania’s dress it looks too round when she´s flying like there is a metal ring in it. I think it should be more open and collapsed hanging a little more loosely maybe a little more u or v shaped rather then O shaped. It could have a cage inside of it? Maybe not. I think you need to include something. At this point some readers, myself included, have forgotten how these portals work. Something quick and to the point. +1 to the single page scenario, but two pages would be welcomed as well. BTW: the flashback was great! Someone with more time than I have available right now can check this, but weren’t Dan and Alex aware that the bad guys were spying on them prior to the battle with Nicodemus? I think some question by Alexander to bring out the fact they need portals on both sides would be good, just to make it clear – but then you still have to explain why Abaddon wants the one portal so badly. • Does he want it to make sure that even if another one is built on Earth, he’ll control where they enter Dreamland? • Does he want to study it to figure out how it works, to use the technology behind it for some evil purpose? • Could he use the one portal as some kind of inter-dimensional ‘radio’ to broadcast nightmares into this world? Abaddon went to a lot of effort to get the portal. If they can’t make it work to reach Earth without a portal here, there needs to be a plausible reason he went to so much trouble. Abaddon was planning a siege of Earth 3,000 years ago. Ramses II found out. Destroyed the portal on Earth. For 3,000 years, Abaddon has tried and failed to recreate the portal…and to find Seraphopolis to STEAL the portal to REVERSE ENGINEER it. Until Nastajia’s parents gave them the perfect opportunity to surprise them. Now… Abaddon has the Rosetta Stone (so to speak) and for the last 2 years… he’s been building (somewhere on Earth) the second portal. Wow, Scott I think that when you put this into book form it will more sense with the flashback and if you added the part about the reverse engineering even better. Just my 2 cents have a great day. Okay I checked back a few days and see you did mention Abaddon needs a working model to build a new one. Wouldn’t hurt to mention it again with the bit about building one on Earth. Which leads to a couple of questions – could Seraphoplis build a replacement for the one that was stolen – and use it to connect to the one Abaddon Is building on Earth? And could Daniel build one if say Alex was able to bring him plans? Lots of fun stuff to speculate about! They’re going to Nightmare Realm all by themselves?! Are they out of their mind?! So what will Alex, Nastajia and company do now after this flashback??? It’s good that you placed Titania’s dress far enough away in the bottom panel or else, I would accuse you of having all your readers look up her skirt. She’s probably wearing bloomers. Wouldn’t worry too much about it. Dang it … I want wings. I WANT WINGS!!! Also, ask yourself this question: Is your concerns about the portals just explaining the Force? AKA is it necessary? Or are you creating midichlorians? ‘Reason with Lord Abaddon”? They either already know him and think they can get through to him, or they are wildly optimistic. I suspect the latter. I think it would be nice for a comment, just remind the reader. Also, I hope we see the Nightmare Realm soon! We’ve had such lush, beautiful landscapes so far…I imagine it’ll be dark and scary! Looking forward to it! Also, I’m curious to see if Alex can fly in the Nightmare Realm, since kids aren’t supposed to be able to. I figured they need a portal to PHYSICALLY appear on earth, in the same manner that Alex, Dan, and Nicole are present. So far, unless I misremember, they’ve been apparitions and unable to directly affect the world around them. It’s a great spy technique, but useless for global conquest. I love finally knowing what happened to the King and Queen. So excited to see where this is going to go next. It’d be nice to see him becoming less clueless and always needing everyone else to fill in the blanks for him. Hard to tell if people reading this much faster than a page a day would have forgotten the obelisk story by this point. That said, Alex asking a (seemingly) dumb question is, well, the very Alex we all know and love. Should be all right, I guess. Xaxnar’s question, on the other hand, still needs an answer. Badly. All right, on to TWC. Lo and behold, we went one position up! #5: 4,719 <= us! That us! #6: 4,643 <= close. Too close. Vote, fellow Readers! Vote like the most devoted voters could vote, and then some! Well I didn’t get the 2 portal thing until Scott explained it. Don’t mind me. I’ma justa herpa-derpin’ along! yes. If you have to explain it in the comments, you have to explain it in the book. The problem I see with your explanation is that it is not consistent with the motivations of the characters. If Ramses destroyed the Earth portal, why dud Abbadon desire the Dreamland portal? Why did Seropholous feel obligated to protect the now useless remaining portal? Why did Nastajia’s parents have to recover or destroy it? Frankly, I don’t recall much, if anything about the portal. I do read it once a day (once I caught up several years back). I guess it’s time to go through all the books. Until you all mentioned it.. it thought it was new. One of the best strips yet man! If only I had thousands of dollars laying around to give you, but I don’t. I might donate $25 toward kickstarter, I just have to find out how, because I my debit card hasn’t been renewed for awhile and I don’t know why. Those bookmarks you were going to offer if you reached $20,000 in funding looked awesome/epic. 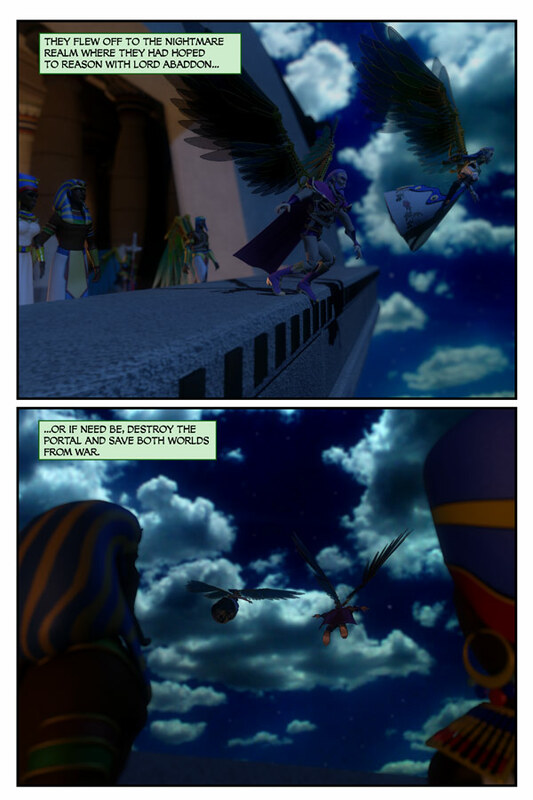 This comic has been getting better and better both in plot, animation, and well, just plain fun! I hope you’ll keep receiving fitting gifts and ect. for giving the world The Dreamland Chronicles! and i really want an nick plushy. I appeared that on the internet~~`I can find the ways to solve my problem~~~ most people will associate with along with your website.